"Location is good, beside of it, nothing is good." "Staff and friendly and helpful!" 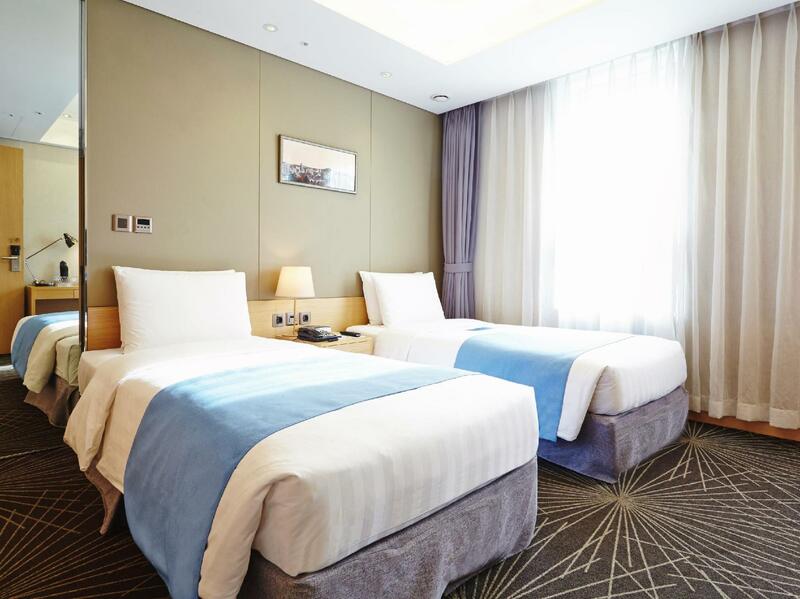 "overall good location with friendly staff"
Offering quality accommodations in the shopping, sightseeing, and restaurants district of Seoul, Days Hotel Myeongdong is a popular pick for business and leisure travelers alike. This convenient location makes it easy for guests to access the city's attractions and must-see destinations. At Days Hotel Myeongdong, every effort is made to make guests feel comfortable, so the hotel provides the best in services and amenities. Experience high quality room facilities including blackout curtains, a desk, a coffee or tea maker, and internet access to recharge after a long day. This great location, along with all the amenities and facilities offered, makes this hotel the right choice for visitors to this area. 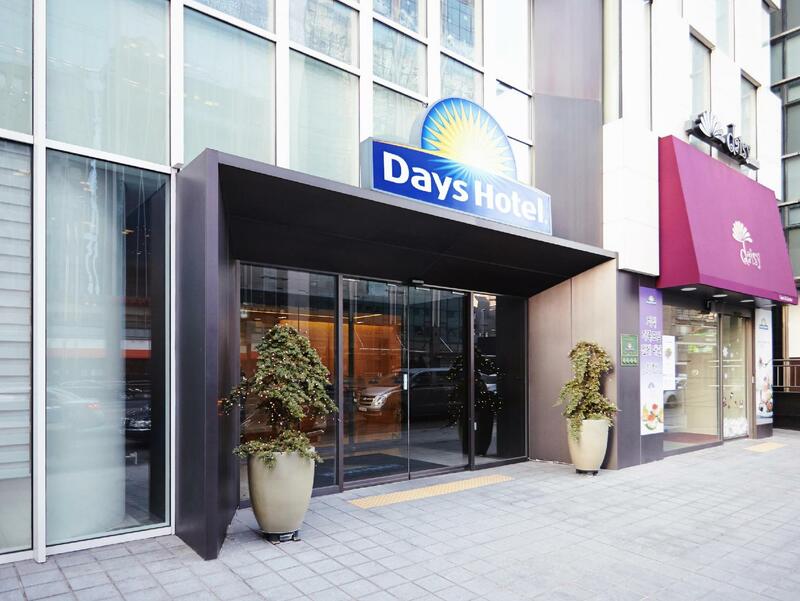 Days Hotel Myeongdong is an ideal place of stay for travelers seeking charm, comfort, and convenience in Seoul. "Good location and room tidy and clean." Good location with a reasonable price, clean room. only room size a bit small. The hotel’s location is the best! Myeongdong shopping and the subway is just outside the hotel. Easy access to sightseeing places and Namsan Tower is within walking distance. Staff were always polite and rooms were clean despite being on the smaller size. You have to pay for early check in but you can store luggage in the lobby. Overall will recommend this hotel. This is our second time staying at Days Hotel. Chose this place for the superb location, and the room rates are very value for money considering the location. Rooms are slightly small, but everything else was good! Great location! Staff were friendly and greet us whenever we leave or return to the hotel. Small room with limited space for 2 luggages. But we had a pleasant stay and will stay here again if I do come back to Seoul in future. Had good stay with hassle free check in/out. Hotel staffs are approachable and are very polite. The only service that they should improve is the cleanliness. I appreciate that every they do the housekeeping but I noticed the coffee mugs was not clean thoroughly and still have coffee stains. Tables were a bit dirty, with dust. Overall it wqs a good stay. Might be checking in again when I'm back since the hotel is very accessible to places like myeong-dong, N Seoul Tower and Subway, Even Namdaemun is just 5 to 8 minutes away. Just a one min walk from subway exit. Famous isaac toast is just at Hotel entrance. 3 min walk to the best money exchange in town. Soundproof is not good - can hear what the next door is talking about. well I know can't expect too much given with this reasonable pricing. Still highly recommended with its location vs pricing. Myeongdong shopping street is just right behind the hotel, a lot of street food stalls, cafes, restaurants around. Only problem is communications with staff is restricted and they can only speak basic english, so it's quite difficult to explain problems if you have. Location is good right next to the Myeongdong subway. Room size is small, just barely enough for us to open up both of our luggage at the same time. The room is clean. They are very strict in terms of early check-in, so don't expect that, but you can leave your luggage with them and go around if you arrived before check-in time. Stayed 3 nights in Days. Location was superb, jus next to Myeongdong Station (line 4). Less than 2 mins and you are in Myeongdong shopping area. Didn't try the breakfast buffet so cannot comment on that. Issac Toast was jus outside the hotel. Standard room size was acceptable though if bigger will be better. Staff could communicate in English so it was good. Will stay here again next time. The hotel location is great, its only take 1 - 2 mins walk to Myeongdong subway. And the Myeongdong street is just behind the hotel. Will definitely book this hotel again. Location alongside Myeongdong - one stop location to shop. Walking distance to Namdaemun Market. Travelled by train to hotel from airport. Located in between Myeongdong exit 5 (stairs) and Myeongdong exit 4 (escalator). Located near famous Issac Toast as well. Convenient because if you walk further down to myeongdong exit 8 that is where the airport bus is. The airport bus frequency is high. It cost 15,000 won per person and takes approx 75 mins to bring you directly to Incheon airport terminal 1. Hassle free. Room is bright, clean and cosy. Bed is comfortable except that pillow is too low. The hotel is in good location, right next to Myeong-dong station and Isaac shop. The room is small but acceptable considering its good price and location. The only drawback is that the carpet is sooo dirty with many stains. Tips for the people who choose to stay inn this hotel. 1. Bring your own towel. I found a hair on our towel. So the hygiene is questionable. 2. Bring your own slippers. The hotel offers reusable slippers, which is actually quite eco friendly, but I still prefer to wear clean ones. 3. Don’t choose this hotel if you have more than one suitcase. 4. Don’t turn on the air conditioner in winter. It makes the room stuffy. Excellent location and friendly staff. However, the sound proof in the room is yet to be improved as I could hear water running in the toilet all night long. The central temperature in the room was fixed at 23-24 degrees and it was too hot for us. Other than that, it was a reasonable price during peak season. Pros: location near Myeongdong metro station (use exit 7 for escalator instead of exit 5) & near Myeongdong shopping street, room is clean, room space sufficient if no big luaggage, toilet is spacious. Cons: no laundry service, carpet stainned, no early check-in allowed. 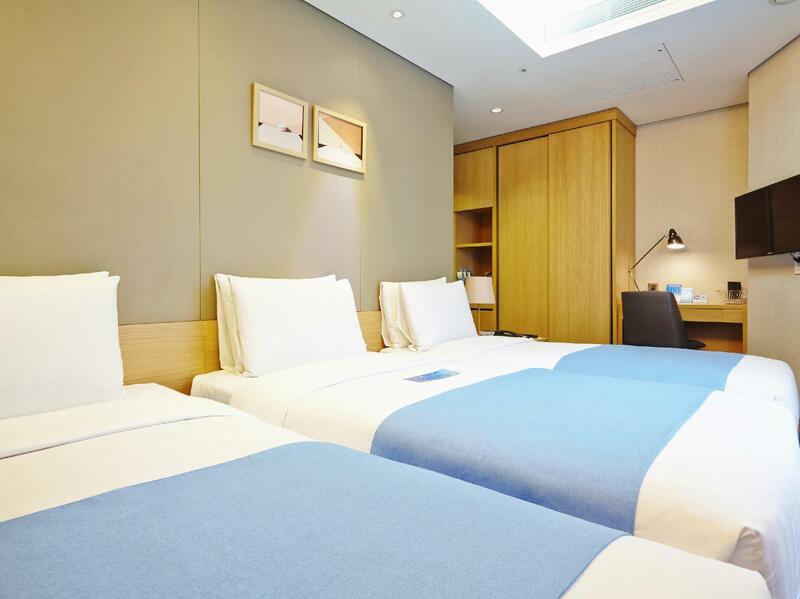 This hotel's central location is certainly enjoyed by guests, as Myeongdong shopping district is perfect for most tourists. Guests also mention that having Isaac Toast Restaurant just a stone's throw away is very convenient, as this is a popular spot for breakfast.